Tumblr has come a long way since its humble beginnings back in 2007. Six years down the road, the short-form blogging and social networking site boasts more than 87 million different blogs and remains one of the most popular microblogging platforms of our time. Users can quickly and easily share text, photos, audio, and pretty much any other kind of multimedia you can imagine with a simple click of the mouse, trackpad, or touchscreen device. Plus, the site is completely free to use and features some of the most visually appealing layouts and designs of any blogging platform out there right now. However, it does take a little while to get a handle on the thing. Here’s our how-to guide for getting started with Tumblr. Try to ignore the recent Tumblr outages, Twitter abandonment, and the site’s big leap into the “sponsored products” market (aka advertising) — it’s a small price to pay for broadcasting your precious content into the blogosphere. Creating an account is the first step to getting started with Tumblr. Go to the homepage and click the Sign Up button in the upper-right hand corner to begin the process. The site will ask you for a valid email address as well as your desired password and username (you can change these later). Afterward you will have to input your age, test your wits in a captcha test, and fill out a brief questionnaire describing what you’re into (e.g. art, fitness, education, etc.). 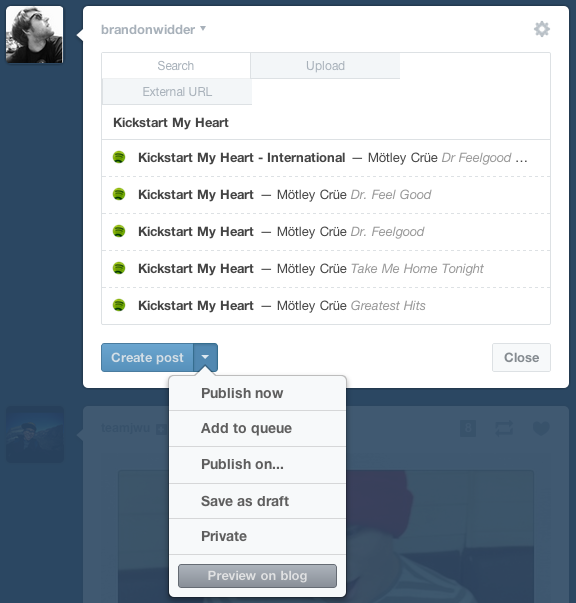 After the initial sign-up questions, Tumblr will recommend a list of blogs for you to follow based on your interests. For example, if you’re a political nut, Tumblr may recommend for you to follow Politico or the always-enthralling U.S. Department of State blog. Luckily, you can skip the recommendations for the time being. If you want, you can also find people you know using your Facebook or Gmail accounts. Click Next when you finished with the sign-up process. You will need to verify your email account before you can fully access all Tumblr has to offer. Log in to the email account you registered with, open the email aptly titled “Tumblr verification email,” and click the Verify email address button to complete the sign-up process. You’re now ready to roll. Tumblr will create a default “Untitled” blog automatically when you first create your account. It’s nothing fancy, but you can rename it, and customize it all you want. To create a new blog, click the down arrow in the upper right-hand corner of the Tumblr dashboard and choose Create a new blog. You will be asked to title your blog, and choose an appropriate URL. You will also be given an option to password protect your blog so it can only be view by people who enter your chosen password. The best part about a blog is making it your own. 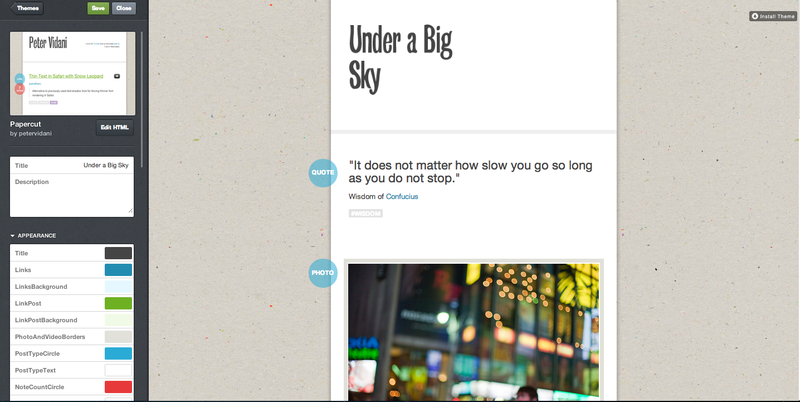 To get started, choose the Customize option in the upper right-hand corner of the blog you want to customize. You will then be given options to name your blog, choose its theme from a list of premade options on the left-hand side, and a plethora of advanced options such as using an optimized mobile layout and descriptive links. Keep in mind some of the premium themes will cost you anywhere between $10 and $50, but there are plenty of free alternatives for the casual Tumblr. Unfortunately, there is no way to directly edit the code like you can on many other blogging platforms so customization is rather limited. Once you’ve settled on your desired layout design, it’s time to start hammering out content to make your Tumblr blog worthwhile. At the top of your dashboard, you can find a banner housing seven different content icons: text, photo, quote, link, chat, audio, and video. These represent the different types of content you can post to your blog. Although each option posts a different type of media, all seven choices will provide you with options for scheduling posts, adding tags, saving them as drafts, adding them to your queue, and making them private. Tumblr makes it incredibly easy to post whatever type of content you want. If you want to a post a particular song for example, click the headphones icon at the top of the dashboard to upload, link, or even search for a specific song using Soundcloud or Spotify. Click the dropdown menu to the right of Create post to schedule a specific publishing time, save it as a draft for later editing, make it private, or even add it to your queue so you can stagger your blog posts over a period of hours or days. Keep in mind Tumblr does have some limitations when it comes to content. For example, you can only upload five minutes of video a day and post 10 photos at any one time. The limitations shouldn’t restrict you too much, but it is something to think about if your trying to post a photo album or high-definition video.